Harm Reduction International is pleased to present the first of a new series of Evidence and Advocacy briefings entitled ‘Advocating for Needle and Syringe Exchange Programmes in Prisons’. 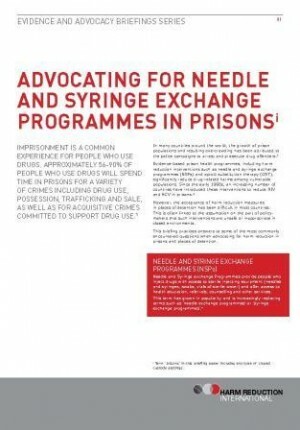 This new series based upon research presented in the Global State of Harm Reduction offers an up to date overview of the current state of needle and syringe exchange programmes in prisons and answers key questions that commonly arise when advocating for NSPs in prisons. Present clear and concise evidence to strengthen advocacy strategies. Provide the framework and language to challenge the position of prison authorities who are in opposition to the provision of sterile injecting equipment in prisons.